Save your Physicians and Nurses time and help them do what matters most - provide patients with the best possible care. MedNews Plus provides medical professionals Breaking Medical News and Conference Coverage, by Specialty, with Free CME / CE and on-line tracking - all branded as coming from you, the Provider. You help keep them "in the loop" by adding customized messages with important hospital information and news, targeted to their interests. Teaching Briefs and Conference Reports, sourced from over 100 top journals, over 100 Medical Conferences, academia, government and more. Includes opportunities for free AMA PRA Category 1 CME for physicians and free CE for nurses. monthly e-mails containing articles on topics like practice management, patient relations, finance, marketing and technology. 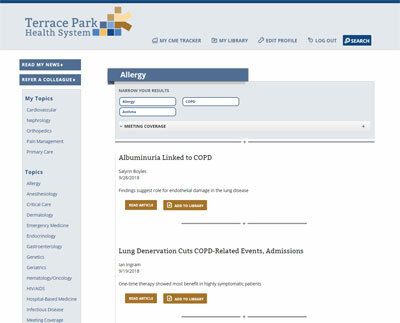 a powerful CRM tool that allows you to send targeted e-mails about important hospital information, programs and services based on each physician's specialty or areas of interest, at any time. tracks all awarded CME/CE; includes printable certificates and monthly/annual summaries. A powerful CRM tool that allows you to send targeted emails based on health interests and/or demographics, informing your subscribers about special programs and announcements. Proven Outcomes impacting Clinical Quality, HCAHPS, Communication/Engagement, Usage and Relationships.